Tangled and True: whimsy wrap. If you're on my Christmas gifting schedule, I'm not too late to introduce the holiday wrap that puts the solid unmanageable rolls to shame: Whimsy Press offers premium gift wrap in extra large, double-sided sheets with prints ranging from fabulously festive to fantastically fun. Check out the Oh So Festive line: "a fresh take on traditional holiday themes with some classic cuteness thrown in for good measure." Or the non-traditionalists can even find "a blizzard of modern holiday cheer with just a dash of traditional red & green." 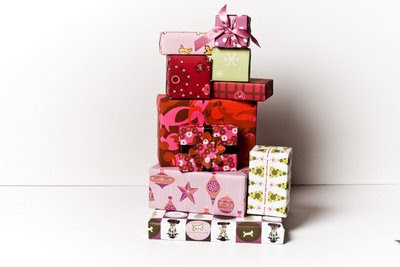 The holiday gift wrap collections include 10 sheets of designer wrapping paper (that’s 10 different designs!) along with coordinating gift tag stickers for just $40. I'm all about a whimsical holiday!